On 9 May 2002, the Post Office of Moldova (Poșta Moldovei) issued a postage stamp with the title EUROPA 2002 - The Circus . The issue comprises one stamp, with an associated cancellation (postmark) and first day cover (FDC). The designer was Filimon Hămuraru. The printing was performed by Bundesdruckerei, Germany. 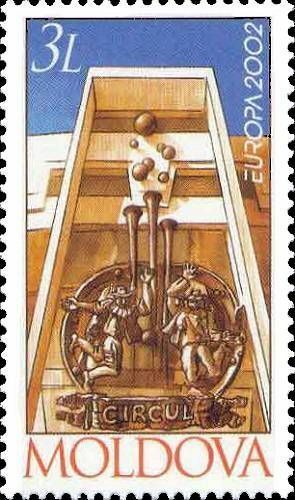 Europa stamps are special stamps issued by European postal administrations/enterprises under the aegis of PostEurop in which Europe is the central theme. EUROPA stamps underlines cooperation in the posts domain, taking into account promotion of philately. They also build awareness of the common roots, culture and history of Europe and its common goals. As such, EUROPA stamp issues are among the most collected and most popular stamps in the world. Read more.. This article uses material from the Wikipedia article 'Europa_postage_stamp', which is released under the Creative Commons Attribution-Share-Alike License 3.0.